Great communication and check in process! House was very clean and great location. Enjoyed our stay and will return! Five stars. We were able to pack a lot of people in this condo comfortably! Great location, especially for the price. Parking is a bit of a pain... only one spot ($30) for the condo; but we were able to park extra cars in the $5 overnight lot and take the shuttle. Easy check in process, and Ski Colorado was very hands off once we got there, which we loved. Felt private. Thanks! Amazing location, right near ski school, rental and the slopes. Clean apartment, great for a group of 3-4. Has everything you need in the kitchen. Check in / check out requires going to the office which is an ~8 minute walk away. That was the only inconvenient part. The rest of our stay was really comfortable. Location is great. We walked to many places including restaurants, gondola and shops. Love the included underground, enclosed garage. Liked the amount of bedding, pillows, blankets provided. Love that master bath has shower and bath so you can use both or either. Bathroom sizes are great. Perfect views from windows and balcony. Just beautiful. Loved the gas fireplace on a time. We arrived early to pick up the key and they gave it to us and told us they would call us when unit was ready. They called us to say it was ready before check in time. Loved ski in and out feature. We were extremely happy with this condo. The location is perfect! short walk to lift 9 (quicksilver) as well as the shops near lift 9. The main street shops and restaurants are also very easily walk able, even in very heavy snow/icy conditions. If you want to go to other lifts the bus stop is literally at the bottom of the steps. The condo itself is perfect for 2 couples, maybe 3, but the upstairs bedrooms/bathrooms arent the most private because there is no door to the loft bedroom or the bathroom from the hallway. We had 2 couples and it was awesome! we definitely plan on being back. Simple and easy reservation and checkin experience. The condo was perfect for a spring break ski trip with my daughter and I. 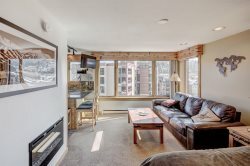 The Beaver Run condo has been updated recently and there size was ideal for 2-3 guests. The true ski-in/out property allowed to maximize our time on the mountain. We will definitely like to stay here again. Very convenient to Quicksilver lift and The Village. Great view of the mountain and access to the hot tubs. Property is small, but adequate for two people, convenientl to the lifts, and the town of Breckenridge. We were extremely happy with this condo. The location is perfect! short walk to lift 9 (quicksilver) as well as the shops near lift 9. The main street shops and restaurants are also very easily walk able, even in very heavy snow/icy conditions. If you want to go to other lifts the bus stop is literally at the bottom of the steps. The condo itself is perfect for 2 couples, maybe 3, but the upstairs bedrooms/bathrooms arent the most private because there is no door to the loft bedroom or the bathroom from the hallway. We had 2 couples and it was awesome! Kitchen was fully stocked with plenty of dishes and pots/pans as well as plenty of seasonings. We definitely plan on being back. I booked online and that was easy. I got a phone call from the team before my arrival, checking in and giving directions. I also got a clear and thorough email. The day after I checked in, I got another phone call asking if everything was all right. The biggest problem for me was that the office was a few blocks from the property. I should have dropped off my bags in the lobby first and then checked in, because as it was, I had to lug them through snowy streets, and the altitude almost killed me (I didn't have a car, I used a shuttle and the bus system). The other option would have been to take a bus back to the transit center, and then to the property, because there was no route directly between the two. I was worried that the property might overlook the street or the plaza and be loud, but that was not the case (it was south-facing). I was very pleased with the unit. As others mentioned, some of the furniture was worn (the bar stools were covered in cowhide which was 1. uncomfortable; 2. worn off in several places. They have got to go.) but it was comfortable enough. The kitchen was attractive and well-appointed, though the silverware was very cheap. The only thing I missed were some storage containers for leftovers. I didn't watch the TV but it was quite small and in an odd location. The bed was fine. The bath and shower were large. The room seemed clean and not musty, as someone else commented. I really enjoyed the hot tub and sauna in the building, and it was great that it was so close to the chairlift (easy walking distance) so I could come in from lunch. The nearest bus stops were about a block away in most cases. Shopping and dining was also within easy walking distance. Ski colorado vacation rentals were very accommodating. It was snowing hard and we had to move our shuttle up to avoid missing a flight and they worked with me on getting the keys returned otherwise I would have been pushed for time. Property was clean and had all the accommodations needed for our trip. Bed sheets were a little small for a kind bed and kept popping off the corners but not too big of a deal. The ski hanging rack was a nice touch used it every day. One thing I will say is if it is going to be sunny that day remember to close the blinds or it will be prettt hot in there. Cant beat the location of the village at Breck! We would stay here again! We enjoyed a quiet, relaxing stay in this comfortable and clean condo. We called for additional firewood and it was delivered promptly to the room. I especially love the ski storage and ski in/out convenience. The whole experience was seamless from check in to check out. The condo has an easy and comfortable design. The kitchen is open to the living and dining area. The fireplace is an added level of comfort. The view is of nature, a snow and tree covered landscape. Amazing experience! The staff is so friendly and accommodating. The house had everything you could ever need! Clean, fully stocked kitchenware. Everything worked in great condition. The house was in the perfect location to get to peak 9. Outstanding home; beautiful and well kept! Great location! We decided to take a last minute trip up to the mountains with some other couples and this place offered the perfect getaway. Perfect mountain retreat with enough room for 3 couples to comfortably unwind. Great communication, always available, easy check in and check out. Great location, everything in the condo worked and was clean! The humidifiers were also helpful.